You all know I love a good trip to the fabric store. But to be honest, I didn’t take that photo to share with you all. I actually snapped it to send to Mr. P, because I needed his opinion: did he like either of those fabrics for a crib skirt? I admitted I liked the floral damask, but worried that it might be too feminine for a little boy, since obviously this girl was drawn to it like a moth to flame. So I sought Mr. P’s input, as the other male in the household. Not that I’m a fan of enforcing gender norms – I just thought a fellow dude would be a good judge of what to put in his boy baby’s room. 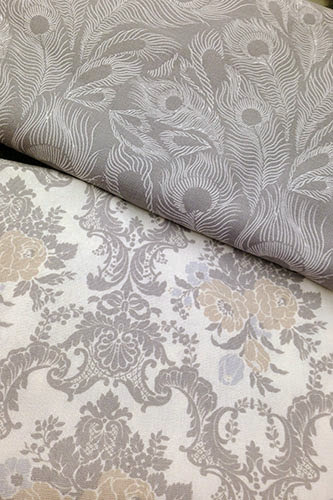 But Mr. P actually preferred the damask over the feathers, too. And Baby P gave me a good hearty kick when the saleslady cut it for me, so I’m going to take that as unanimous approval! 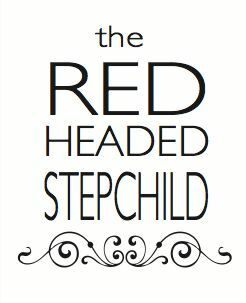 As for why I wanted to DIY a crib skirt – aside from the obvious “getting to take a trip to the fabric store” – I had several reasons. It’s a swell opportunity for hidden under-crib storage, and I think it looks nice and polished. 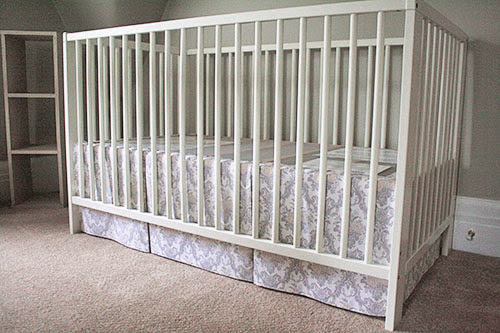 By DIYing, I could ensure it is adjustable (apparently, most store-bought crib skirts are only suited for one of the crib’s two height settings). And finally, I should say that I have no intention of purchasing one of those fancy full sets of crib bedding, which would presumably come with its own skirt. Full bedding sets seem silly given that you can’t actually use much of it for safety reasons (no pillows or bumpers or quilts in the crib, after all). If we only need sheets and a skirt, plus maybe an extra blanket to the side, I can pick out my own coordinating pieces for a lot less cost – or DIY them, as is the case with this skirt! So! 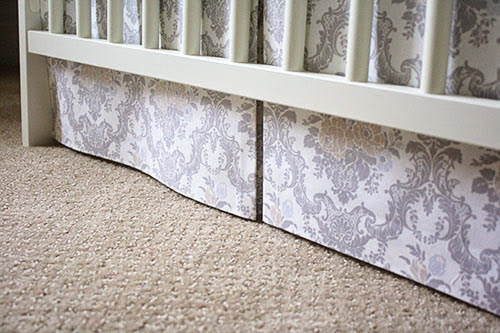 I turned to the internet for advice on how to DIY a crib skirt, and came across two similar tutorials, here and here. 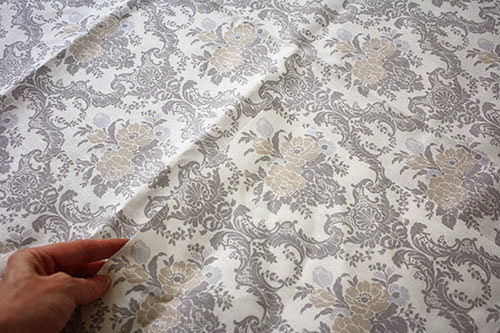 I was immediately delighted to discover in both tutorials... you just make no-sew fabric panels. 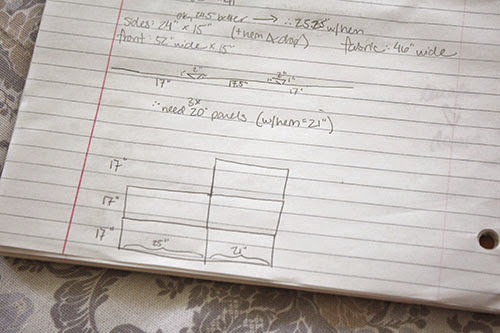 Holy moly, do I know how to make no-sew fabric panels! Turns out making a skirt for a crib is basically no different from making a skirt for an aquarium stand (twice over) or a bathroom sink. Huzzah! 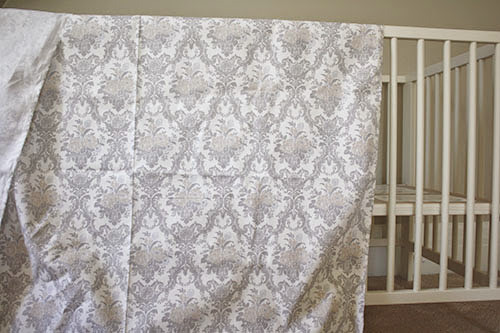 For the sides, I wanted a single panel as wide as the crib and as long as the drop to the floor, which was easy to plan (just add a inch or two for hems and to fasten at the top). 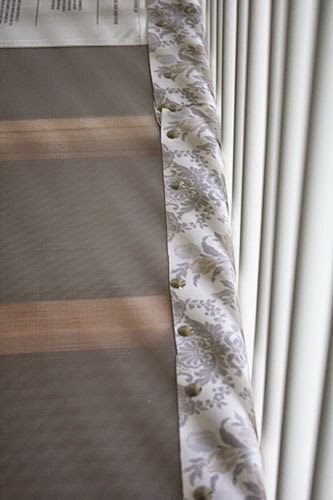 But for the front, I decided I preferred a pleated look, similar to this gorgeous but super pricey RH crib skirt. Rather than create a single piece of fabric 52” wide with pleats out of 44” wide fabric, I decided to cheat and make faux pleats between two 17” panels flanking an 18” panel (I wrote 17.5” in my sketch below, but ultimately did 18” for a smaller gap between pleats). That meant those panels were actually 20” wide, and I simply ironed in pleats on the edges. The side panels were 17” in front, with a 1” fold toward the back and 2” fold toward the front on the side nearest the middle. The 18” panel just had 1” folds back. Hopefully you can see what I mean below! If you have a fabric with both horizontal and vertical repeats like mine, it’s super duper important to make sure you always cut panels with the same part of the design along the bottom edge. You can use the panels you’ve already cut as a guide. See how the panel I’ve cut disappears into the fabric below? 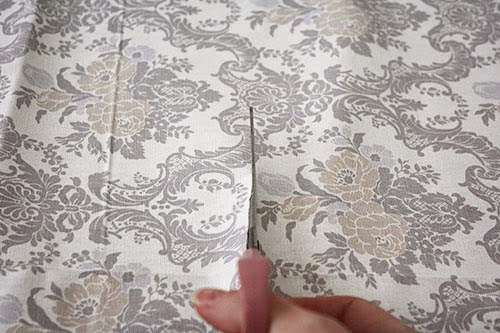 It might mean a bit of wasted fabric, because you have to cut your panels out of specific places in the yardage rather than against the edge. But that’ll make it look like a single piece of pleated fabric, which looks fantastic in the end! 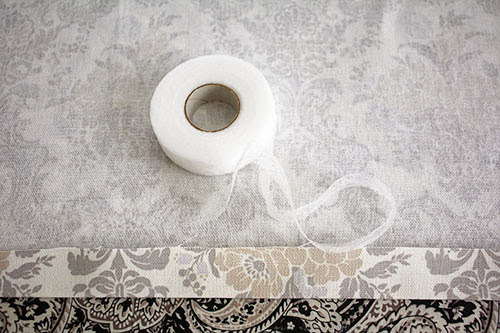 You can even check if you like the hem and size along the way (with a little help from random décor items nearby) before you iron in the tape! 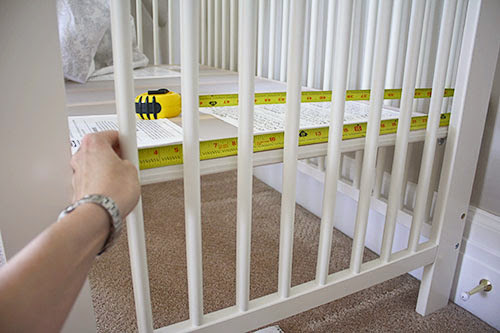 After all the panels are pressed (including pleats) and hemmed, it’s just a matter of attaching them in a removable way (so they can be adjusted when the bottom of the crib is lowered). How you do this is entirely dependent on what your crib base is made of. My GULLIVER has wooden edges and slats, with a fine mesh entirely encompassing both the top and bottom of the base. Since the edges are wood, I thought perhaps this method with thumbtacks would work... but turns out, IKEA wood is hard, yo. I couldn’t get thumbtacks in the wood without bending them (and I wasn’t about to dissemble the whole thing to hammer them in with a rubber mallet). So, I settled for pushing them into the tight mesh instead. That’s obviously not quite as secure as into the wood, but I figured the crib mattress will end up holding it all in place... unless we grab to change the sheets quickly in the middle of the night and tear the whole thing apart, hmmm. So, I might still throw a few staples just into the corners – not so many that they’ll be a pain to remove later, but just a few to keep it all in place. And that’s it! 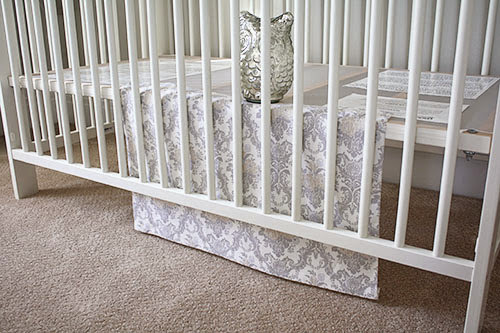 A crazy easy crib skirt that can be adjusted as tiny new roommate grows! Sorry for the iffy lighting – the storms around here are wreaking havoc with my natural light. It’s a bit hard to see my faux pleats, but they look pretty great to me, especially considering I just ironed them into the fabric and pinned them at the top! About two hours, start to finish. Measuring and designing my panel plans took a good half and hour, as did cutting out my fabric. Ironing the panels and attaching them into place took another hour, because I’m picky. Also, did you know they make crib sheets the zipper off for quick changes?! Talk about genius! You just put the sheet on but the top can easily be removed/replaced. Can't say we had to change crib sheets often but even once in the middle of the night, this would have been handy :) Again, crib looks beautiful!!! Really beautiful.. and, cheap! Does the skirt continue in the back, up against the wall? @Janice, velcro is a great idea! I might upgrade it if I ever make it back out to the fabric store. I was so sure thumbtacks would work that I didn't consider alternatives. Finally - the cost savings. Wow! 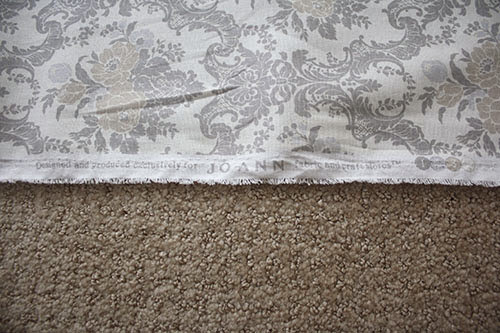 Yours is way prettier than the linen at $100+. Just wow.